/ Is the Jersey Devil’s range increasing? New Jersey’s pine barrens might qualify as the strangest stretch of woods in the world. It is completely out of place, a huge thick pine forest with only a sparse rural population situated among developed and largely urban New Jersey. The Pine Barrens is just the type of place for a cryptid, and boy does it have one. Of course, I speak of the Jersey Devil. The most famous tale of the origins of this cryptid is of Mother Leeds. In 1735, the story goes, the good mother had given birth to twelve children. Said to be a witch, Leeds said that if she had child number 13, it would be the devil himself. Variations of the story say that the Devil was the father, but in any case, the child was born completely normal. Within minutes, it killed the midwife, grew a horse’s head, forked tail, wings and hooves and escaped through the chimney and went directly toward the Pine Barrens. But this may not be entirely true. The Native American Lenni Lenape tribes called the Pine Barrens “The place of the dragon”, and other name places and accounts may suggest an origin that predates Mother Leeds. The first well documented sighting dates from the early 19th century when the famous early American naval commodore Stephen Decatur visited a foundry in the barrens searching for a source for decent cannon balls. He related a story of seeing a white creature with huge wings flying overhead, and directed cannon fire at it. The story goes that the creature was entirely oblivious to the hole Decatur made in its wing. Perhaps the most famous person to see the Devil was Joseph Bonaparte. Most people aren’t aware that this older brother of Napoleon Bonaparte, and former King of Spain, called Bordentown, New Jersey home for some years. Unwelcome – and perhaps wanted – in Europe he fled France before the capture of Napoleon and bought a lovely rural estate, not far as monster flies from the Pine Barrens. He is said to have confided to his advisers that he saw the Jersey Devil in 1820. In the 1840’s the Devil was blamed for numerous livestock killings (though one wonders how many of those were actually related to the UFO phenomena). But, unlike many cryptids and paranormal phenomena, the sightings of the devil increased. 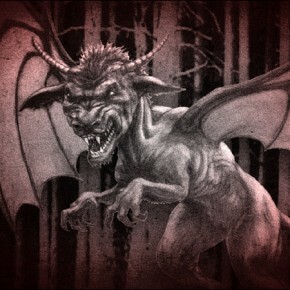 By 1909 thousands had claimed to see the Jersey Devil, most of them between the dates of January 16-23. Newspapers went wild with the story, Numerous accounts of the horse-faced, winged devil surfaced, and mass hysteria set in. The devil was said to attack a trolley car, schools closed, a local fire department claimed to stave off the monster with a hose, and the local economy screeched to a halt when business owners were too fearful to open their doors. Sightings continued with regularity throughout the 20th century. But the range of the Devil seems to be increasing. 2008 has already seen two sightings, both well out of the Pine Barrens area, and well out of New Jersey in fact. The first was January in in Litchfield, Pennsylvania, where a farmer saw the creature in his barn. The second was in Rising Sun, Maryland on August 18th, 2008 where three people observed the creature flying past their car, landing in a field a short distance away. Can You Lure The Jersey Devil With Cake?